We are now coming to the end of our stay on Gough Island. It has been an interesting visit to what is probably one of the most remote islands in the world. It is also one on the most significant sea bird breeding areas in the Atlantic and the home to an endemic albatross the ‘Tristan Albatross’. This bird has become critically endangered due to predation on the chicks by mice that have been on the island for around 200 years but only recently learned the habit of literally eating the chicks alive. While this may seem impossible, the chicks are immobile until almost fledging age and are not able to move in order to dislodge the mice that are attacking them. These birds live a long time but, in common with most sea birds of this size, only breed once every two years. This year at least 70% of the breeding has failed due to predation by mice so it is vital for the survival of the species, that mice are eradicated. We have carried out two bait distribution trials on some of the very steep vegetated areas to check what percentage of bait remained on the ground and what bounced or rolled off. From this information we are able to establish the amount of bait that needs to be applied to ensure that there is sufficient for all mice on the island to have access to it. We have carried out a couple of flights to look at parts of the island that are inaccessible by foot. This has been done to allow us to ‘design’ an application plan that will guarantee complete bait coverage. As part of these flights we have located suitable loading sites at two locations and can use this information to help with the logistics of setting up the operation. We have also had to locate areas suitable for the storage of just under 200 tonnes of bait (that’s 14 x 20 foot containers full) and safe parking areas for up to 4 helicopters. Security of the helicopters is a major risk factor as the island is subject to sudden violent wind gusts and we have experienced some of these. 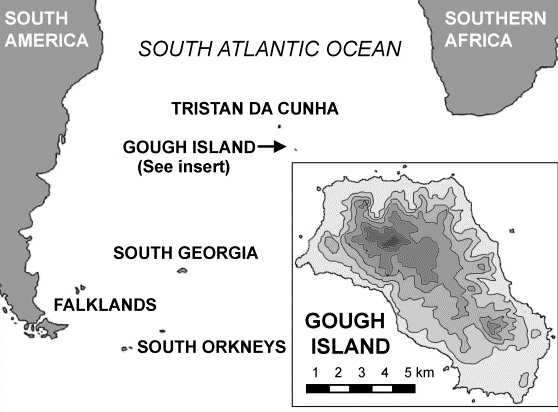 Gough Island is part of the Tristan da Cunha group of islands which also includes St Helena the island where Napoleon was imprisoned by the British after the battle of Waterloo. It is a UK Overseas Territory and is administered by its own Government. The South African National Antarctic Program (SANAP) has a weather station on the island and this is the only habitation. It normally has a contingent of weather and scientific people of about 8 people who are here for a twelve month period. We have come as part of this ‘relief and re-supply’ voyage so the base is very full with both the out-going team and the in-coming team along with several scientific groups doing biological and oceanographic studies. The South African Government lease a site of approximately 18 hectares from the Tristan Govt and, as part of this lease agreement, are required to provide accommodation for any Tristan (or UK) needs. It is under this agreement that we are here. Environmental issues on the island are managed by the Tristan Department of Environment and we have, as part of our team, Trevor Glass who is the senior environmental officer for Tristan and one other Tristan islander. They are here to help us with our work but also to oversee any other environmental issues on the base and around the island. Early on in my visit here I was flown out to a ‘Northern Giant Petrel’ colony half way along the western side of the island with Dr John Cooper. Here we visited all of the nests in the colony checking the leg band numbers on all the nesting birds. This is part of an on-going study of this species and we were trying to establish records of breeding pairs. These birds are much calmer than the Southern Giant Petrels we were dealing with on South Georgia and didn’t seem to mind us lifting there legs to check the band numbers. The South Georgia birds would have taken your fingers off!! This was a great opportunity to work up close with the birds on a scientific project and was very enjoyable event though it was a 5 hour slog to get home the next day. We have now completed the amendments to the Operational Plan and drawn up an Eradication Project plan which will be the governance document for the project. Much work will still need to be carried out such as choosing contractors for the supply of shipping and helicopters but these items are out of our control. We get back on the ship on Tuesday 1st October and will return to Tristan where we will have one or two days ashore before we depart for the 3000k trip to Cape Town on the 4th. I am looking forward to being back in Wanaka on the 14th. October 8 Complaint to Regulations Review Committee. Our deadline has been extended to 8 October. In all, around 25 members has submitted their costs with these ranging from around 25% to 400% increases. We’ll release our submission to you in next week’s newsletter. After that, we will be asking you to take some further action and we’ll be also pursuing a number of other avenues. Please consider donating to the fighting fund as this enables us to engage external help. October 09 First meeting of New Logistics group (old Supply and Services and AEANZ) at Domestic Terminal, Auckland Airport 10.30am start. – all members are welcome to attend but the specific focus is getting this new group going. President Dale Webb will chair . October 30 First meeting of merged Training and Development Group – Wellington 10am, Level One Aviation House. One of the items on the agenda is to develop a “Student in Aviation” network to grow our newest potential employees. Are there any skills that are particularly sought after? Are there regional variations in levels of demand? Have there been any major changes/developments that have occurred in the industry over the past year - or about to occur- that should be noted? Aeronautical engineers usually earn between $73,000 and $90,000 a year. Do these figures sound about right? Do you have more accurate/up-to-date figures? Current entry requirements for the job. Your PR material – the Peter Garden letter came from him regularly keeping in contact with us. We want to tell more of your stories because this is what will excite our stakeholders and the wider community. It also gets the “good news’ out there. A ‘good news’ story: Airways New Zealand aviation expert Lew Jenkins has won the prestigious Jean Batten Memorial award from The Guild of Air Pilots and Air Navigators. Regarded as one of the world’s premier aviation accolades, this recognises Lew’s outstanding contribution to New Zealand aviation, in training and leading professionals in air navigation services. The award will be conferred in London on 23 October. Great to learn that ticket sales for Warbirds over Wanaka for 2014 are 20% up on the same time last year. The Queenstown Lakes District Council’s new major events fund is investing in the airshow. Flights on the spitfire are now all fully booked but some remain on the Kittyhawk. A large number of Australians are expected for the event. Congradulations to Nokomai Helicopters and Helicopters Hawke's Bay 2006 Ltd on their Aircare™ Renewals. Register with GETS to get this intelligence on a regular basis. The World Bank is progressing with a US$32m project for Samoa. It is designed to secure operational safety and oversight of international air transport and associated infrastructure. Public notification has occurred see attached, the project appraisal will be finished on 15 November and World Bank Board approval is expected on 28 February 2014. The project will then go to tender. The Samoa Airport Authority is the implementing agency. The World Bank has approved US$2m over 5 years to the Pacific Aviation Safety Office (PASO) in Vanuatu. This funding will allow PASO to address financial shortcomings in its present financial model, develop a central data repository and electronic document management system, and refine its management systems to improve financial sustainability. October 15 CAA 1300-1600 Radio Frequency Outside of Controlled Airspace click here - if you wish to attend as part of our representation please let us know as we have to facilitate your access to CAA. LIB 4 – the CAA have finally responded by saying it will go into the rulemaking pot for analysis of the issues. Which is as we expected the big question is what to do with LIB 4 – we think it should be withdrawn or heavily amended/qualified as it creates risk for the Regulator. GD on Colour Vision – we still need to hear from you if you know of any colour impaired pilots flying. From the information we have there have been multiple standards applying – with medical issues we find that not too unusual. What is unusual is that normally the standards are becoming more liberal however in this case there’s been a tightening over time so one would expect anticipate the colour vision is becoming more of an impediment to working safely as a pilot. Pilot shortage – at the SANITI conference this week never have we seen so few pilots being given excellent addresses by so many employers. The number coming through the schools today is around a third of what it was a few years ago and the even scarier thing is next year is looking bleaker still. Competitor Collaboration Guidelines – draft guidelines have just been released for comment. We’ll be looking at them and the implications they may have for our international work. GST Cross Border Issues and neutrality on international contracts. A few of you have asked whether the intended change, removing GST on B2B contracts (training is likely to be the major beneficiary), will come into effect on 1 April 2014 as scheduled. We’ve asked IRD for an update.